Want to be a better social media marketer? Take a look at our list of social media marketing podcasts and learn from the very best in the industry! Did you know a whopping 26% of Americans (about 73 million) listen to podcasts at least every month?! That’s up from 24% in 2017! What if I told you one-third of Americans ages 25 to 54 listen to podcasts monthly! Those are some serious numbers that continue to grow every single year! But why the heck are podcasts getting so much attention? The answer is simple- we are all so BUSY! Podcasts is the perfect medium to help you keep up with your favorite topics and discussions. You can listen to a podcast while cooking, working out, on your morning commute to work, or even in the shower! In a multi-tasking world, you can listen on the go. One of our jobs as digital marketers and social media marketers is to keep up with the latest tools, algorithms, trends, strategies, and all the happenings in our crazy/genius world of the internet. Podcasts are an excellent way to do just that! A veteran in the social media space, Social Media Examiner’s podcast is a go-to social media podcast. Social Media Examiner equips you with everything you need to know in the world of social media and how to market your business. Discover success stories and expert interviews from leading social media marketing pros in a weekly 45-minute podcast. Listeners can quickly gain insights into how successful businesses employ social media, learn new strategies and tactics, and gain actionable tips to improve their social media marketing results. Posted every Monday, The Science of Social Media shares the most cutting-edge social media marketing strategies from brands and influencers in every industry. From the good folks at Buffer, a famous social media automation tool, the science of social media is a fun and insightful listen. No matter if you are a solopreneur, CEO of a large company, social media marketer, or someone simply interested in social media marketing, you’re sure to find something useful in each and every episode. A weekly podcast hosted by Scott Ayres and Richard Beeson, Social Media Labs invests over $15k per month to help “Crack the Code” of social media and then report those results to you so you don’t have to do the dirty work! From the team behind Agorapulse, a social media management tool for businesses, Social Media Lab finds answers to important questions like “Can Emojis in a Facebook Post Increase Reach?” or “What are the Best Type of Instagram Stories to Catch User Attention?”. If you don’t have the time, or the budget to conduct such experiments yourself, you must give Social Media Lab a listen! Each week host Tyler Anderson gets up close and personal with top brands and leading experts to discuss the latest in social media, content marketing, and more. Casual Fridays cover everything social media and find out what’s working and what’s not working across Facebook Marketing, Instagram Marketing, YouTube Marketing, and more. If you are looking for some actionable advice and insights, Casual Fridays is a good place to start. As the name suggests, Marketing over coffee is a podcast hosted by John J. Wall and Christopher S. Penn in a local coffee shop every Thursday morning. Each episode of the Marketing Over Coffee podcast is about 20 minutes long and is filled with the kinds of marketing tips and tricks that you can only get from casual conversation outside of the office. It’s a perfect companion to your morning breakfast, workout, or office commute, making it one of our favorite marketing podcast on this list! Don’t know how to spend money wisely on paid ads? The Art of Paid Traffic is just the podcast you need. The host, Rick Mulready goes in-depth with all the bits and pieces of social media marketing and how to spend your money wisely. From finding the right audience for your Facebook ads to discovering what’s new in LinkedIn marketing, TAOP is a must for core practitioners of social media marketing. Gary was one of the few people who started their own YouTube show right at the dawn of the platform back in 2006 and was one of the first people to reach a million followers on Twitter. Gary is an internet pioneer and spits out pure knowledge on how to build and sustain a social media audience with hard work and patience. With massive followings on nearly all major platforms, GaryVee knows what he’s doing and as a social media marketer, you should pay close attention! SocialPros describes itself as “Real people doing real work in social media”. SocialPros is a podcast hosted by Jay Baer (President of Convince & Convert) and Adam Brown (Executive Strategist at Salesforce) which dives into the inside stories and behind-the-scenes strategies of huge companies and brands like Ford, Dell, IBM, ESPN and more and how they manage and measure their social media programs. Social Pros was recently named the best marketing podcast at the Content Marketing Awards and certainly deserves your attention. Thinking about creating an online course? Want to promote with webinars? Need help with your Facebook ads? Online Marketing Made Easy is going to help you with questions like these on a daily basis. Hosted by leading online marketing strategist, Amy Porterfield, Online Marketing Made Easy puts its primary focus on small business owners and solopreneurs who have decided to embark on the entrepreneurial journey but don’t know where to go next. The host makes the podcast fun and casually listen and at the same time, is filled with actionable tips to the brim! If you want to learn how to integrate social media, experiential branding, digital marketing, and the latest technology, SocialZoomFactor is the podcast for you. SocialZoomFactor host Pam Moore (CEO/Founder Marketing Nutz) was ranked as a Top 10 Social Media Power Influencer by Forbes. Pam Moore drops knowledge 5 days week so you always have something to listen to while going to the office! So there you go, folks! Above are some of the best social media marketing podcasts doing rounds on the internet. 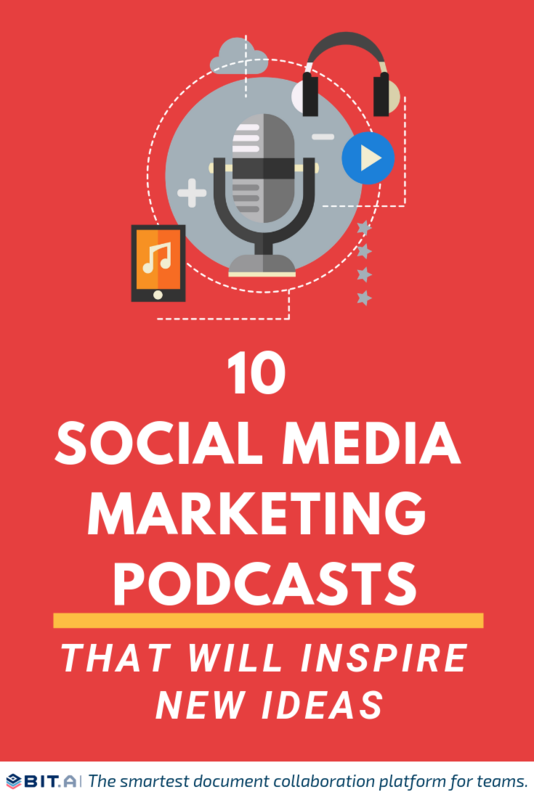 These podcasts are bound to keep you up to date with everything social media and marketing and will keep your marketing brain sharp as ever! If we missed your favorite social media marketing podcast, do let us know by tweeting us @bit_docs. Happy Listening!